FLIR E4, E5, E6, and E8 infrared cameras are powerful and extremely cost-effective, easy-to-use troubleshooting tools for building, electrical, and mechanical applications. Four resolution options are available (ranging from 80 x 60 IR pixels to 320 x 240) to fit the target size, working distance, and detail you require. All include MSX® technology that provides extraordinary thermal imaging detail. 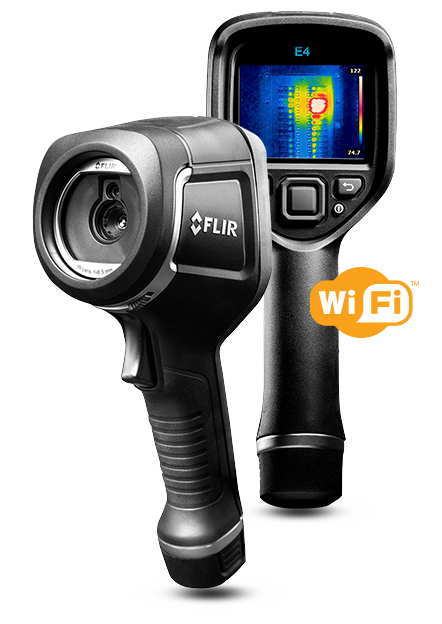 Wi-Fi connectivity to smartphones and tablets via the FLIR Tools Mobile app makes sharing images and sending reports from any location easier, enabling you to make critical decisions faster. By providing thermal images to help you find hidden problems along with accurate temperature measurements, an Ex-Series camera is the ideal budget-friendly replacement for old-school IR thermometers.